TAUNTON, Mass. 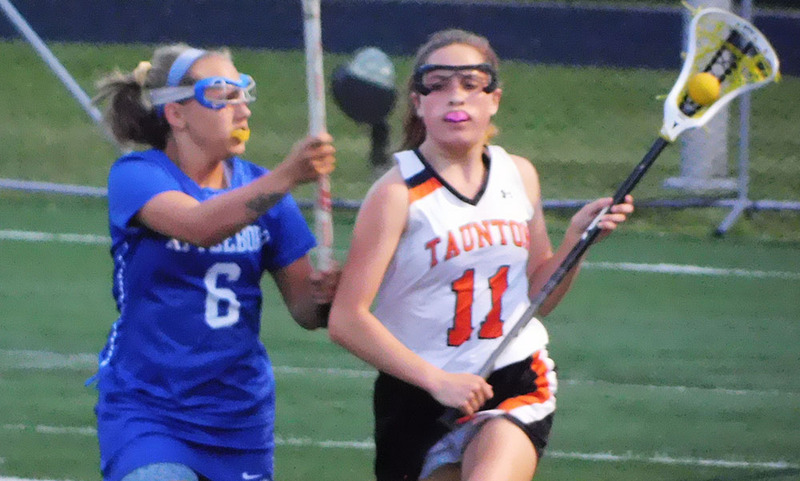 – Propelled by a combined 10 goals from freshman Alana Tavares and senior Hannah Moniz, Taunton emerged victorious on their Senior Night, besting Attleboro, 14-7. Tavares led the team with six goals, while Moniz scored four for the Tigers in their season finale. Taunton first put themselves on the board 2:10 into the game as Tavares found the back of the net to give the hosts the early advantage over the Blue Bombardiers. Moniz doubled the lead with 21:58 left in the half as she hopped up in front and sent a shot past the goalie to make it 2-0. The senior midfielder added another goal with 19:54 remaining, while Tavares added two more herself at the 19:00 and 17:26 marks respectively, giving Taunton a 5-0 advantage less than 10 minutes into the evening. Attleboro would even out ball control slightly more in the coming minutes, as they had a couple of chances that either missed or were denied by Taunton senior goalie Lorna Li. With 10:26 left, Moniz added another goal to the Tiger tally, making it 6-0 until Attleboro senior Ali Wall put the Blue Bombardiers on the board with 7:44 remaining in the opening half. Tavares scores her fourth goal of the evening with 6:17 left, as she headed up the middle to fire on the Attleboro net. Junior Kyra Lyons added a second Blue Bombardier goal off a free position restart with 4:05 remaining, though the Tigers would head into the half with a 7-2 lead. Taunton freshman Rosemary McGrath added another goal to the host’s lead just 37 seconds into the half. The Tigers scored the next three goals for a 4-0 run, with goals coming from senior Kayla Phillips, McGrath, and Tavares with 24:08, 22:31 and 18:36 remaining in the half, respectfully, as Taunton held onto their commanding lead. With 17:21 remaining, Wall took the ball herself down the field to put it into the back of the net to make it 11-3. That scoreline didn’t stay the same for long, however, as sophomore Sydney DiLiddo added another goal to the Attleboro cause 10 seconds later, making it 11-4. DiLiddo added another goal with 16:40 left, maneuvering her way through the Taunton defense before finding the back of the net to make it 11-5, energizing the Bombardier comeback effort. That effort, however, would suffer two setbacks as Tavares and Moniz less than a minute apart at the midway point of the second half to extend the Tiger lead to eight. The Blue Bombardiers made an offensive push, with senior Hannah Aspinwall making it 13-6 with 7:13 left to play. Junior Holly Kaihler added another run with 2:46 left, sending a quick one-hop shot in the Taunton net, though that would be the final Attleboro goal of the evening. Sophomore Kamryn Li solidified the results with a goal with 34 seconds left, and the Tiger seniors were able to walk off their field for the last time victorious. Comerford praised her team’s effort on improving passing and communication both in the game and over the course of the season, particularly the four seniors. “Kayla [Philips], Hannah [Moniz], Lorna [Li] and Diana [Brens] did phenomenal, nice job this year,” Northup said. The game marked the end of the Tigers season, as the team finishes the year with a 2-8 record in the Hockomock League (7-10 overall). Attleboro (1-9 Hockomock, 2-13 overall) has three games remaining, and return to action Thursday as they play host to Norton.